From: Larry Catalano To: bevans@coutsfamily.com Subject: Family History Hello! Was just looking at your family history on-line. My ggrandfather was Charles Wesley Francis- the Ice Cream Man in Pueblo, Colorado. Just thought I'd say hi! Bev C.
Barb- I will mail it tomorrow. It really is pretty long, so just use whatever part you choose. It was kind of fun to re-read it. Hadn't done that for awhile and both my grandparents passed away before I was born, so it was interesting to re-read my Mom's (Mary Ellen) and her sisters memories of growing up in the Ice Cream Business!Take care! Bev C.
Subject: Bandini Couts Women I got your e-mail address from a Couts family website. I'm writing to get any information I can about Arcadia Bandini Scott Brennan. at Arizona State University. I'm working with two professors there, Dr.
and I especially interested in getting in touch with any family members. as I can. I would so appreciate any help and information that I could getfrom you. Subject: Stark/Couts connection Hello! Today I have spent the day reading all your Couts newsletters and enjoying them thoroughly. I have to say I'm a bit disappointed that I have now learned that Mary Magdaline isn't accepted as a bonafide Couts and may be a Woodward......not that I have anything against the Woodwards! I even have a cousin who married one! :-) Seriously, I'm wondering if either of you have come up with any proof since the publication of the newsletter? I have been told that Dietrick "Teter" Couts had these sons and daughters: John, Christian (Christophor), William, Henry, Elizabeth, Mary Magdelina, and Margaret. They lived in Loudoun Co. VA circa 1754, the Shenandoah Valley circa 1760, and KY and TN 1783 (Robertson and Warren Counties). in cyberspace! But truly, Walter & Mary M. had a daughter no one seems to know about but me and only through the research of the editor of the Dorrisnet do I know it! daughter was my ggg grandmother, Susan Stark. 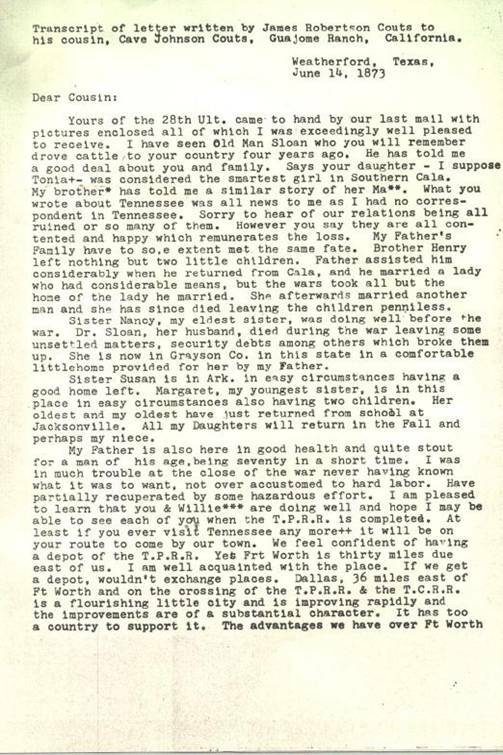 She married James S.
which became Manchester TS, Clark County, AR. the place whereas Walter Stark lived at the time of his death." One can read this as being the rights James held in the Stark land based on his marriage to Susan. Robertson County Deeds spell this out clearly (1844: 4/367)when Susan Dorris sold her rights to the lands of her "father and mother" Walter and Magdalene Stark to her "brother" Levi Stark. So we have three records - two of which Harris and Jorgensen either ignored or did not know about - that show that Susan Stark was the daughter of Walter Stark and married James Dorris. From the publication "Dorrisnet" by Gene Dorris. According to the 1850 AR census Susan was a widow and born abt 1800 in TN. To: "Ann Parker" <aharwellp@hotmail.com From: "Barbara Evans"
Hi Barbara, I love the puzzle of genealogy! In fact, I'm afraid I have an addiction! bigamist, that connected the Couts lines in Tennessee and Kentucy"
for certain; so should you find anything concrete, I definitely would be interested! J. R. COUTS, president of the Citizen's National Bank of Weatherford, and probably the wealthiest man in Parker County, was born in Robinson County, Tennessee, April 6, 1833. The blood of the thrifty, industrious German courses through the veins of this family. During the days of colonial unrest, when an infant republic had been born in the new world, an emigrant from the fatherland took up his abode in one of the southern commonwealths, probably North Carolina. John Couts, the grandfather, was born in North Carolina [sic: North Carolina claimed the Tennessee land along the border with Kentucky]. He moved into Tennessee when a youth, there grew to manhood, married and was a farmer in moderate circumstances. One of his sons was James Couts, father of our subject. He was born in Robinson County, Tennessee, August 12, 1803. His life was devoted to the cause of his native state until 1834 when in response to a desire to make his home in the west, he moved his family to Lawrence (now Randolph) county, Arkansas. He settled on a new farm which he improved, and in 1858 came with his son, J. R., to Texas. Here he spent his declining years, dying in 1890. J. R. Couts received poor school advantages. At the age of nineteen years he married Martha Hardin, with whom he lived happily until 1894, when she died. Their first home was on a small farm in Arkansas which supported them until their removal to Texas in 1858. They came by team, crossing Red river at the mouth of Mill creek, and as they came westward, were on the lookout for a location. Stopping in Kaufman county, Mr. Couts inspected the western counties on horseback as far west as Comanche county, then the extreme frontier, and selected a permanent location in Palo Pinto county, bought a small farm on the old Fremont survey of the Texas and Pacific Railroad, and engaged in the cattle and horse business. A few years afterward he was obliged to abandon that business on account of the Indians. Mr. Couts next opened a small banking concern in Weatherford, under the firm name of Couts & Fain, which was succeeded by Hughes, Couts & Company, and that in turn by J. R. Couts & Company. The Citizen's National Bank was the outgrowth of the last named company, and was organized in 1881 with $50,000 capital, and with J. R. Couts as president. Early banking in this county was exceedingly profitable. The country was covered with stock, and this point was headquarters for stockmen of large means. Deposits were enormous, rates of exchange good, and a large surplus soon filled the vaults. In addition to his banking interests Mr. Couts owned about twenty-four thousand acres of land in Parker and adjoining counties, most of it under fence and fronting on the Brazos River. Six children were born to Mr. and Mrs. Couts, namely: Mary, wife of S. B. Burnett, of Fort Worth [Mary Burnett Couts Library Texas Christian University]; Susan, wife of A. N. Grant, cashier of the Citizens' National Bank of Weatherford; Martha, wife of Rev. Putnam, of Brownwood, Texas; J. R., Jr., of Weatherford; Maggie (Mrs. H. L. Mosely); and Leah, wife of W. P. Anderson, of Weatherford. Mr. Couts took part in the frontier service before and during the war. He was a Mason for thirty years, and a member of the Methodist Episcopal Church. [Couts United Methodist Church]B. B. Paddock, History and Biographical Record of North and West Texas (Chicago: Lewis Publishing Co., 1906), Vol. I, pp. 226-227. Hi All you Kautz's. I am still trying to find out if I am one of you or if I am of a different line. I know that there is a Kautz family tree and one of these days I will find the missing branch. My father is Steve E. Kautz, his father was Edward Kautz. 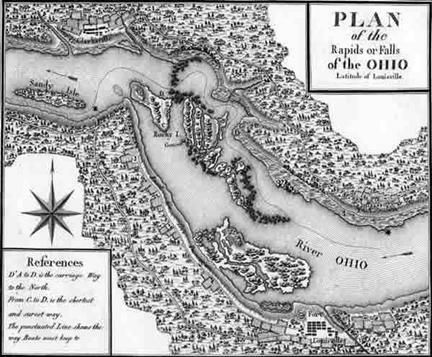 In May 1778 he established the first English-speaking settlement of the area on Corn Island at the Falls of the Ohio. This island at the head of the falls provided protection from British and Indian attacks. He began his daring raid with 153 frontiersman/soldiers on June 24, 1778. Clark would later write in his journal of a solar eclipse. "We left our little island, and Run about a mile up the River to gain the main Channel, and shot the Fall at the very moment of the sun being in a great eclipse which caused Various conjectures among the superstitious." Astronomical records confirm the eclipse. The boats must have passed over the Falls about 9 a.m. The expedition captured three British forts-Kaskaskia, Cahokia, and Vincennes along with British general Henry Hamilton. He was known as "the hairbuyer" because he paid money for scalps of the American settlers. After the capture of Hamilton at Vincennes Clark wanted to continue to Detroit, but his Kentucky contingent were diverted to Chillicothe, Ohio. Clark and his soldiers were awarded 150,000 acres for service to their country in 1783. This area was north of the Falls in present day Indiana. 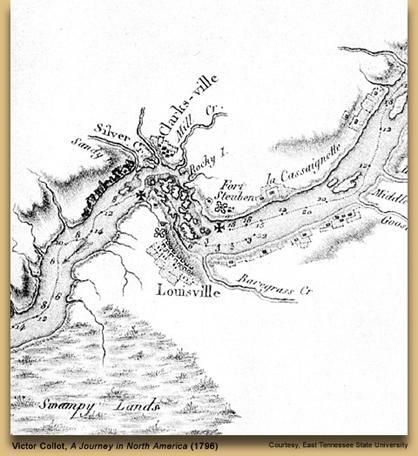 Clarksville became the first authorized settlement in the Northwest territory. To keep his army supplied during the war he had incurred a great debt. The state of Virginia which had ordered the expedition turned the debt to the new government, they in turn said that Virginia was responsible. Clark was left penniless in order to settle the debts. in 1785 for jury duty. Heirs to his brother. Some of Chrisley’s children settled in Indiana in 1812.